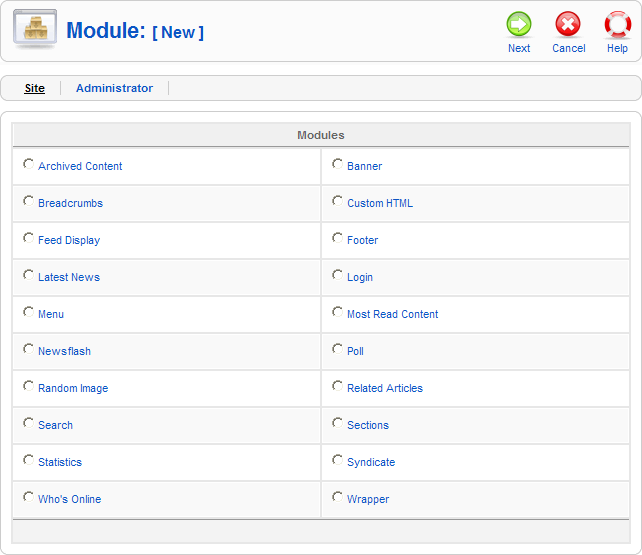 When the New button is pressed, the Module:[New] screen displays all of the Module Types available for the new Module. You can select the desired type either by clicking on the Module Name or by clicking on the Module's radio button and pressing the Next button on the toolbar. Note that you can cancel this action by pressing the Cancel button on the toolbar. A standard Joomla! installation includes a number of default module types. Each has its own function and is described in detail on a separate page. Additional module types, not listed below, may also have been installed on your Joomla site. Help for those module types can be obtained by choosing the type then clicking on the Help toolbar button on the page that is then displayed. This page was last modified on 28 April 2013, at 18:42.